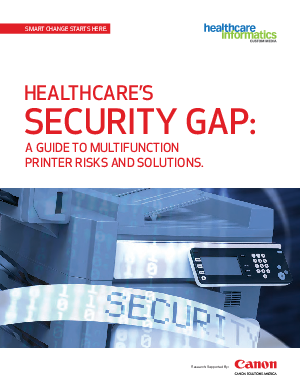 > Canon Solutions America > In Healthcare, Printer Security Can’t Wait. Learn Where the Gaps Are. Help Keep Patient Data Secure. In a climate where data privacy is critical, healthcare professionals can’t risk letting a security gap go unchecked. This comprehensive guide explains the what, why, and how of helping to secure multifunction printers in an easy-to-digest step-by step format. Get the knowledge you need to help make sure your printer environment doesn’t leak private patient data.